In medium bowl, combine all salad ingredients except salad greens; stir gently to mix. In small bowl, combine all dressing ingredients except whipped cream; mix well. Gently fold in whipped cream until well blended. Pour dressing over salad mixture; toss gently to coat. Divide salad greens evenly onto individual serving plates. 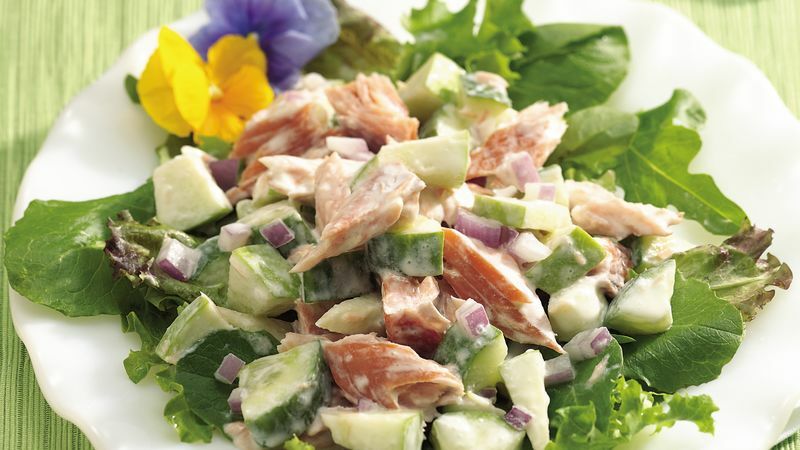 Spoon salmon mixture evenly onto greens. If desired, garnish with edible flowers. Seedless cucumbers are sometimes called hothouse or English cucumbers. They are about 1 to 1 1/2 feet long and have light green to dark green skin. Look for cucumbers that are firm, without soft spots. Seedless cucumbers have very thin skin that does not need to be peeled. This recipe can be made with leftover poached or grilled salmon that has been flaked into bite-sized pieces. Great for a quick lunch with friends, this salad looks sensational garnished with fresh edible flowers such as nasturtiums, pansies, violas or petals of marigolds or violets. Use flowers that have not been sprayed with any chemicals.